Is this Normal Hair Loss or Something Else? You worry about it all the time. You step out of the shower and you see hair accumulating on the drain. Or you see hair collecting on your comb or hairbrush. If you’re concerned about hair loss or thinning hair, then sights like these are concerning, but how serious is it? At RHRLI, we work every day to help our patients find a permanent solution to hair loss. But not all hair loss requires a permanent solution. Everyone loses some hair, but hair also grows back. So we’re often asked: How much hair loss is normal? We want to let you know about the cycle of hair growth and how to tell if hair loss might be permanent. And if you do need a permanent solution to hair loss, we have it. It’s called the ARTAS® system and it uses robotic technology to give you a healthy head of hair. The anagen phase is the active phase of hair growth. Cells in your hair roots are dividing rapidly during this phase and they push hairs that have stopped growing out. The catagen phase is a transitional phase. The telogen phase is the resting phase of the hair cycle. It lasts for about 100 days and affects about 6 to 8 percent of your hairs. This is also the period when you shed hair. There’s no universally accepted count of how many hairs the average person loses during a day, but the widely held belief is that it’s normal to shed about 100 hairs a day, according to Science Daily. A 2008 survey asked 60 men, half of them aged 20 to 40, the other half from 41 to 61. They were asked to comb their hair forward for 60 seconds onto a pillow The younger men averaged about 10.2 hairs per 60 seconds, while the older men lost about 10.3 hairs per 60 seconds. The study shows that hair loss is consistent during the telogen phase. 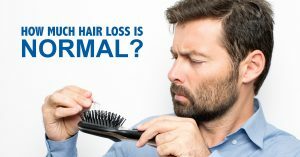 These are all reasons why you shed hair, but shedding hair is different from hair loss, which causes hair growth to stop after you lose your hair. According to AAD, hair loss is caused by things like heredity, harsh hair care products, issues with your immune system or hairstyles that pull on your hair. If you suspect any of those symptoms may have been the cause of your hair loss, RHRLI can help. ARTAS® will look for healthy donor hairs and transfer them with precision to areas where they’re needed. The result is a healthy new head of hair. To learn more, contact us today.